• Surgical linking of biliary-enteric duct. • Sphincter of oddi (which control secretions) can be incompetent. • An infection in the bile duct. • Pneumobilia can be due to an inherited abnormality. • Abscess formation in para duodenal. • Cancerous cells in duodenum, bile duct and stomach. • Sphincter of oddi may be not good. • Bile duct may be rupture and let the air bubble travel towards the pancreas. • Incompetent sphincter of oddi can also cause chronic pancreatitis. • Local necrosis can occur. • Epigastric pain, nausea and vomiting can occur as visible symptoms. 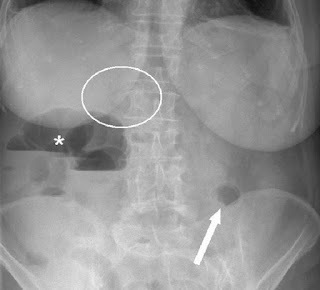 Bilioenteric fistula can show no symptoms in 40 to 50% of cases but can show symptoms when the gall stones pass to duodenum from the gall bladder. In the 1st procedure, the patient swallow the endoscope and the physician will pass it through esophagus to the spot. Now a small plastic tube is inserted in the endoscope to view inside along with a dye. The dye will help to find the exact spot and the instruments will pass to fix if there is any obstruction or release the air bubble. Whereas in 2nd procedure the liver is connected to gastro intestinal tract. Due to air bubble obstruction the duct is bypass. The patient should not eat before ultrasound and should drink a lot of water for better results. Start with the supine of patient and access the pancreas. Now look clearly the common bile duct (CBD) located on the head of pancreas. Follow the common bile duct back to the liver to the point known as porta hepatis. Now measure the bile duct diameter arising from the liver. It is a painless procedure images are seen on computer attached.